If you want to play roller derby, you have to know how to fall. Fortunately, Dottie May Doomsday is happy to teach you—assuming you’re a 12- to 17-year-old girl or boy equipped with knee and elbow pads, wrist guards, a helmet, and mouth guard. Remarkably, the skaters maintain their previous pace around the rink, though it’s slowly for some, a confident speed for others. Almost all of them have only just begun learning to skate in the last two months or so. Dottie blows the whistle, and there’s a scuffling sound, the disconcerting report of one dozen rubber-and-foam-clad knees scraping concrete. They all go down. It’s getting back up, it turns out, that’s difficult. But Dottie has them up and rolling again within a matter of seconds. BOUNCING AROUND: Pinball volunteers as a referee as well as head trainer of the Fresh Meat program. Even when they’re practicing the Superman—hitting the ground first on one knee, then the second with their arms stretched outward so they land on their elbows as well—everyone makes it back up. It just takes a little bit longer. Central Coast Roller Derby has been rolling for eight years and now boasts a whopping four teams, one of which is a Women’s Flat Track Derby Association-ranked travel team. 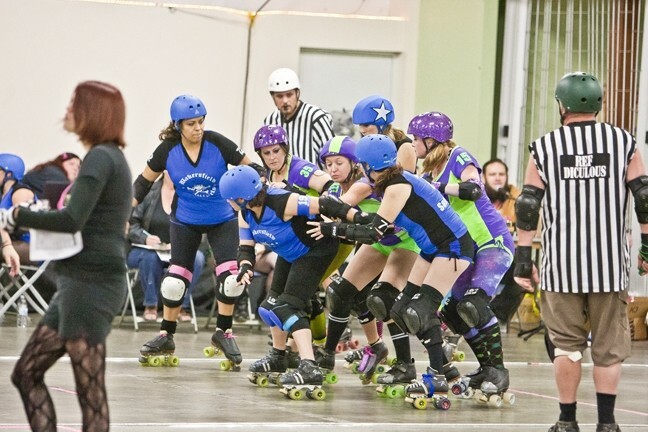 But the junior derby league is a fledgling program begun by Daizy CutHer, a blocker for the Broad St. Brawlers. Technically, the junior league—SLOCO Junior Derby Devils—isn’t affiliated with CCRD, which was the only way to secure Santa Rosa Park as a free practice space. In reality, the coordinators and trainers—led by Dottie—are all CCRD skaters, and many of the junior derby players are kids who grew up watching their moms skate for CCRD. 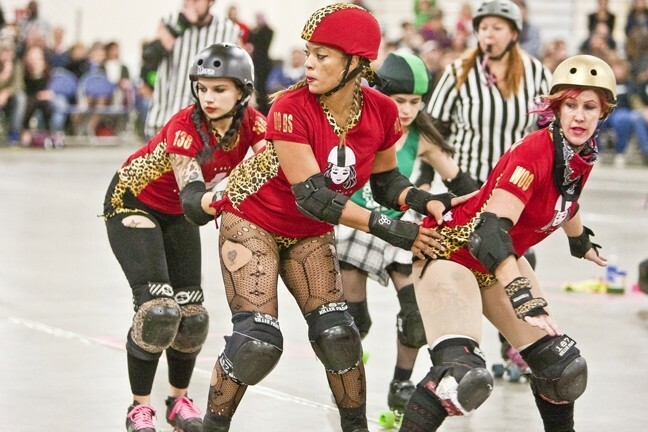 Daizy’s 15-year-old daughter, whose derby name is DarkAlly, inspired her to kickstart the league after DarkAlly took an interest in her mom’s pastime. With junior derby teams in Bakersfield, Hanford, and Visalia, a local team would have plenty of opportunity to compete. It was just a question of getting the effort off the ground. It’s not as though Daizy was bored, or had spare time on her hands. Daizy’s husband, Chris Lawrence, is coach of the Broad St. Brawlers, and Daizy spends a fair amount of time shuffling their three kids—DarkAlly; Braden, 10; and Ian, 7—between school, soccer, karate, and, now, junior derby. She runs The Outreach Program, a Templeton-based organization that enables kids with special needs to play soccer, and describes the effort as “my passion; kids with special needs are my heart.” Rounding out a schedule that would put heads of state to shame, she also works as a special education para-educator for the Templeton School District and as a server at the Berry Hill Bistro in Paso Robles. Still, Daizy believed starting the junior derby league was a worthwhile investment of her time and an important means of helping local children. If you’re surprised by the notion that a small army of eight-wheelin’ fiends in booty shorts and lace tights could, and should, serve as role models for young kids, there’s a good chance you’ve missed out on a few key facts about the league. Chief among these is that they donate the proceeds from each home bout to a different charity. 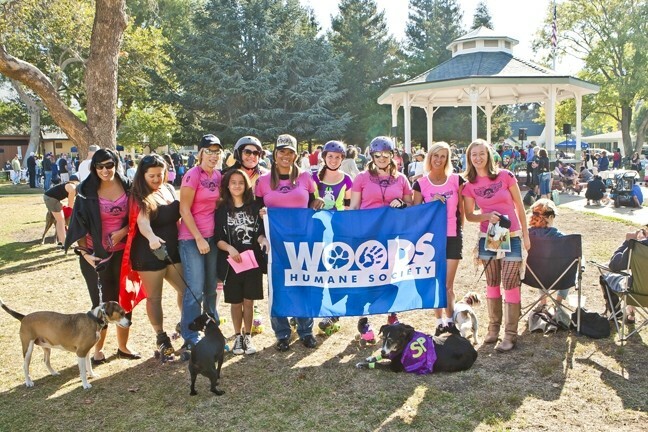 During their 2013 season, the local derby dames donated $6,169 to nonprofits, including Woods Humane Society, the North County Women’s Shelter, the SARP Center, Central Coast Autism Spectrum Center, and Central Coast Funds for Children. Individual players nominate the charities, and a final decision is made by a group vote. When they’re not donating money to charity, the league’s charity committee and promotions committee are coordinating to send players to help nonprofits at such fundraising events as the Cancer Society’s 5K breast cancer awareness walk in Mission Plaza or Woods Humane Society’s Wiggle Waggle Walk. The players, coaches, and referees are unpaid volunteers. It’s all part of CCRD’s requirement that each skater volunteer a minimum number of service hours per month. Broad St. Brawlers blocker and jammer Roll V. Wade compares the time commitment to that of a part-time job. There are the weekly practices, additional practice for the skaters who also compete on the traveling team (SK805), the organizational committees each skater is required to join and contribute to, as well as the requirement that every skater sells a minimum of 10 tickets to each home game. Factor in the $30 monthly dues—and the facts that the season runs from January to November and many players far exceed these minimum time and volunteer commitments—and it’s something of a marvel that the players have time for careers and family. But ask the skaters about the professional makeup of the league, and they’ll tell you the majority of the players fall into one of two careers: teachers and nurses. Roll has her law degree and was working for the American Civil Liberties Union when she joined CCRD—hence the derby name referencing the 1973 landmark Supreme Court decision. There’s a very simple explanation for the stringent demands the league makes of its players. And though the expectations are high, Roll insisted that CCRD is one of the primary reasons she decided to remain in the area when she recently considered moving. But even if the local roller derby league has long since evolved beyond the stereotype of a gritty subculture of anarchist rebels and outsiders—which has always been something of an exaggerated reputation—not everyone’s aware of it. Roll cited the notion that players are allowed to punch and kick one another as among the most common misconceptions people have about her sport. The reality, which is that players block one another with their shoulders and that their elbows must be tucked in when they do it, requires far more control. But misunderstandings about the way the game is played are still a lot less frustrating than encountering locals who don’t even realize there’s a league in their very own backyard. “We’ve been at this for seven years and people are like, ‘There’s roller derby here?’” Roll said with more than a hint of exasperation. WONDER WOMEN: Most of the participants in the junior derby league are still learning to skate, and fall. Of course, she said this as people slowly milled out of a packed Paso Robles Event Center. CCRD’s Double Header Championship Bout on Nov. 16 drew fans of all three teams as the Broad St. Brawlers squared off against Bakersfield Rollergirls followed by a match between A-Town Asylum and Paso Aggressive. The majority of the bouts are more sparsely attended, but family and friends filled the seats that night. And among them were a handful of starry-eyed adolescents, including 13-year-old Hannah who goes by the junior derby name HotWing. “I eat a lot of buffalo wings,” she said with a shrug. 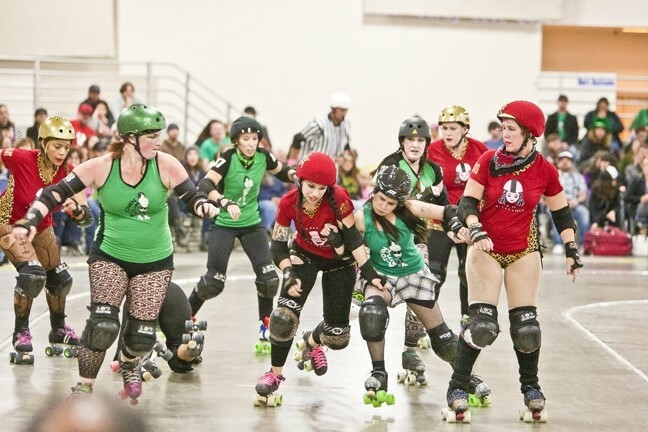 Wearing a black hoodie with the CCRD logo, HotWing bounced in her seat every time Paso Aggressive jammer and SK805 captain Ivanya Skulz made her way around the track. At the end of the night, Skulz would receive the league’s award for best jammer, surprising no one. But she spent the first bout of the night sitting in the front row with Paso Aggressive captain Blaque’N DeckHER—who won the award for best blocker after sending half of A-town Asylum’s team splaying across the track in a match that started out intense and quickly escalated into ulcer-inducing. The two began roller derby around the same time, about five years ago. Both of the star players had to take a break less than a year in—Blaque’N because she broke her ankle while playing, requiring two surgeries before she could return to the track; and Ivanya because she was pregnant. Neither considered making the break from roller derby permanent. Blaque’N turned to roller derby because she was sick of the gym and wanted an opportunity to meet and interact with other women. Ivanya worked at a preschool at the time, and her boss played derby and recommended that she give it a try. Ivanya surprised herself, just as she insists most of the new recruits wind up surprising themselves and their teammates. New players are required to participate in the league’s Fresh Meat program, a 12-week course led by Pinball, a jammer for the Broad St. Brawlers and member of SK805. During the four-hour weekly sessions, new recruits learn what the league describes as basic roller derby skills and rules. The program concludes with a written and physical skills test to ensure that each player is capable of competing safely. It’s an important safety net in a league composed of participants from all different backgrounds and skill sets. From their humble fresh-meat beginning, Ivanya and Blaque’N have built up an impressive skill set—and fan base. Blaque’N recalls being recognized while shopping with her kids at Wal-Mart, and another instance when some of the CCRD skaters visited the unofficial Santa Maria roller derby team. “She said it a lot meaner than that,” Ivanya interjected with a laugh. Both Blaque’N and Ivanya have fans who help cover the steep cost of traveling and competing. B-E AGGRESSIVE: Ivanya Skulz, Blaque’N DeckHER, and My Sharona battle it out with A-Town Asylum. Besides learning how to skate, new recruits have to make an initial investment to buy the requisite gear. According to Ivanya, her first pair of skates cost $200, but that purchase included most of the equipment. She estimates that a first-time player can get everything she needs for about $300. With time, a lot of the players wind up customizing their equipment, which increases the cost significantly. Ivanya’s current skates cost $700, and she had to drive to San Diego to get fitted for what she now wears when racking up the points for Paso Aggressive and SK805. Blaque’N’s skates have more padding, which you would expect of a blocker, where Ivanya’s look precisely molded to her feet. It’s just a matter of preference. Blaque’N and Ivanya are all but inseparable. They hang out together when traveling and practicing, but also during their free time, much of which is taken up by derby-related activities and chores like rounding up gear. They’re the original Paso Aggressive members, and when A-Town Asylum beat them to the color green, which they wanted for Paso Aggressive, Blaque’N and Ivanya chose a red and leopard print color scheme for their uniforms. It makes it easier to buy presents for one another. Choosing their derby names was a little more difficult. Derby names are registered with the Women’s Flat Track Derby Association and are, therefore, permanent. When Ivanya couldn’t think of a good one, her boyfriend suggested Ivanya Skulz. And Blaque’N was in a Facebook group dedicated to coming up with derby names when someone came up with a variation of Blaque’N DeckHER, which she modified and adopted. JAMMIN': Pinball takes a turn as jammer for the Broad St. Brawlers. Choosing a derby name is often a group effort. Family and friends make suggestions, and the ideal derby name conveys a sense of wit, personality, and badassery. CCRD players try to choose a name with mainstream appeal. “They say, ‘Do you want your parents in the audience cheering for that name?’” Blaque’N explained. As the first bout ends and Ivanya and Blaque’N evacuate the front row to join their teammates on the track for their typical warm-up routine—skating in a single line while the player at the back makes her way up the line, hip checking her teammates—HotWing gets even more fidgety. When the announcer begins introducing Paso Aggressive, calling out No. 138—Ivanya Skulz—HotWing jumps out of her chair and yells, “Go Skulz!” before sitting down with a red face. And by the time Ivanya racks up a 29-point jam, basically turning her jam into a ballet, leaping and twisting around and through players, HotWing’s excitement is off the charts. CHARITYWALK: The skaters of CCRD make appearances outside the rink at community and charity events. “Skulz, by far. She’s a really good skater and she’s just super cool and she’s very funny. She has good taste in music too,” HotWing gushed. HotWing wants to be a jammer one day, a dream she won’t have to wait half a decade to realize thanks to the junior derby league. But Daizy and her fellow volunteer trainers aren’t going to make it easy on HotWing—or any of the other adolescent recruits. There are GPA standards in order to participate, for one thing. Also, the junior derby players are going to be required to follow in the footsteps of their adult counterparts. They, too, will be devoting time and energy to raising money for local nonprofits. It might be demanding for the players, but it’s an approach that impresses the parents who are entrusting the CCRD trainers with their daughters and sons. Demi and Jessica Barbito had no qualms when their 14-year-old daughter Sunshine Raye was among the first to sign up for junior roller derby. Around three years ago, Demi made a documentary about CCRD, and the family spent several months getting to know the players. They’ve been fans of roller derby, and the league, ever since. In fact, the family’s shared their enthusiasm with friends, including church buddies, who now regularly attend CCRD bouts. GET YOUR WHEELS ON: If you’re interested in sponsoring Central Coast Roller Derby, or submitting your nonprofit as a potential beneficiary, contact Bratworst Nightmare at bratworstnightmare@gmail.com. If you’re interested in obtaining more information about junior derby, contact Daizy CutHer at DaizyCutHer@gmail.com or attend an informational session Jan. 19 at 3 p.m. at Santa Rosa Park. Anyone who wants to sign up their 12- to 17-year-old daughter or son can bring $55, which covers the first month of dues as well as insurance. Dues are $15 per month. If you’re interested in signing up or obtaining more information about the Fresh Meat program, contact Pinball at pinball_5x5@yahoo.com. For more information, contact info@centralcoastrollerderby.com or visit centralcoastrollerderby.com. In the handful of practices the Barbitos have attended, Demi and Jessica have seen a marked improvement in the skaters’ skills. The newbies still fall during practice, but there’s a casual quality to it, as though it’s happened before and they’re already overcoming their fear. Sunshine was a skateboarder who also participated in dance and volleyball, but she’s learning to skate for the first time. Demi points out that his daughter has a jammer’s body—the smaller, more agile skaters who weave in and out of blockers accumulating points for their team—but having a jammer’s body doesn’t offer any guarantees, and it’s too soon to know for certain how the skaters will evolve. Sunshine has yet to choose her derby name. And the junior derby league, like its first official players, still has a lot of growing. The players have already selected their colors (gold and black) and team name (SLOCO Junior Derby Devils), but they won’t have their first bout for another four months. Between now and then, they’re still hunting for new recruits—adolescents eager to join the seemingly unlikely culture of charity, sisterhood, athleticism, rollerskates, and menacing nicknames. And the already established skaters—even the league’s stars—will be keeping a wary and excited eye on the future of the league. Managing Editor Ashley Schwellenbach is thinking of going by the moniker Hunter S. Stompsome. Send brass knuckles to aschwellenbach@newtimesslo.com.